On Saturday, August 27, ACA Studio launched the STRATA exhibition at Malja Bahrain, curated by Sergio Miranda and Laila Yafi. The exhibition will run from August 27, 2016 to September 24, 2016. Layer or a series of layers of rock in the ground. Thin layer within any structure. A level or class to which people are assigned according to their social status, education, or income. ¿What defines our identity? ¿What makes us, us? This is the timeless question that cultures and peoples across the world have chased throughout the ages. How we distinguish ourselves from others is the very ethos we live by. ¿Why are some standards taboo in a number of cultures, while others openly accept them? In “The Identities of Persons” (1976), philosopher Amèlie Rorty considers a series of layers of person-hood, using literature constructions as a reference point –but also extensible to real life– that gave us inspiration to invite to an artistic debate of what delineates our identity. Her study involves different conceptions around the ideas of Character, Person, Individual, and other multifaceted interpretations of the subject. Each one of these conceptions implies specific characteristics and certain rights and obligations; all of which take us through a intertwined network of possibilities on how to define our selves. Built upon the memory of personal and inherited experiences, and adding the clash between externally imposed and internally developed ideas of what we have-to, what we want-to and what we-could be, the possibilities are endless. Yet even so, our civilization, composed by the sum of its societies, tries to create and unify standards and labels; we try to construct regulated archetypes and paradigms to abide to, as if our identity could be branded, like a consumable product. In this unique endeavor of consumerism, the pursuit of pre-determined standards of culture, and the human journey of discovering new ways of social correlation, we invite you to explore the many strata of identity, and its unfathomable, interchanging complexities. This exhibition was produced in partnership with StudioACA and sponsored by Swiss-Belhotel Bahrain, Greyscale Advertising and Ashrafs Bahrain. To learn more and see photos of the exhibition click here. A restaurant that recently opened in Riffa claims to have the “purist” meat money can buy. They will only source meat from suppliers that separate the male and female goats at birth. They believe that their customers only deserve the best in terms of pureness and quality of meat. As a result they only serve virgin goat meat at their restaurant. Their specially sourced meat is rumored to be the best meat in the market. According to the owner of the restaurant, the goats are bathed, brushed and are exposed to soothing music before they are checked for virginity and slaughtered. This is to ensure that the goats feel special and superior before they are sacrificed. have any extra nutritional benefits. There have been reports from several sources claiming that said meat contains special healing powers. One customer claims that after eating at the restaurant for seven consecutive days he was cured of his HIV infection. Another woman has made claims that the meat has made her more fertile and she has also regained her own virginity after giving birth. These were not the only claims made others have reported that the meat has brought them good luck and, in some cases has successfully warded off the evil eye. Regardless whether these rumors are true or not there seems to be a consensus amongst all the customers, the virgin goats are the sweetest, most succulent meat they have ever had. Especially when served with extra virgin olive oil. 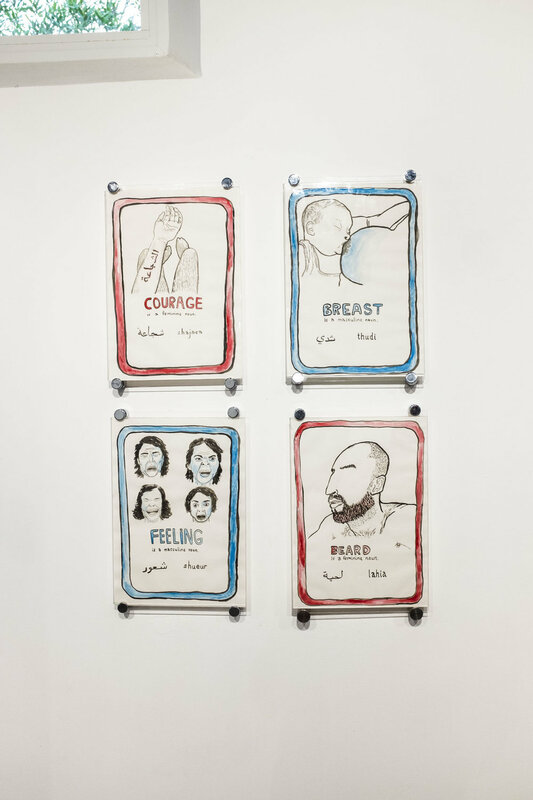 The following work was created to make stereotypical gender identified nouns more visible in the arabic language. These cards are similar to the cards typically used to learn a new language.